People who work in a company or private industry generally work in a team or in some department. While working in a team or department, these employees are bound to follow their higher authority orders and fulfill their expectations. These higher authorities need to nurture the employees in a way that they can find growth in their career line. But unfortunately some of the employers doesn’t believe in following that. People even differentiate a leader and manager in a completely different manner. Most people often mistake management as a form of leadership, but in reality both aspects are totally different from each other. Leadership skills is defined as the ability of an individual of inspiring and encouraging others to work hard and provide a more efficient result so as to uplift the success of the organization or the team of which they are part of. Their personality styles are easily recognized by the aura of charisma and confidence that they emit and they are often touted as the force of the group. They are individuals who do not fear in taking chances and risks and they are comfortable in any kind of challenges that come their way while achieving for a collective target. Leaders rather focus on providing a sense of encouragement rather than imposing authority over others. They are more driven towards achievements. Management is usually a more cold approach to the whole collective sense of guiding a team. The management task usually consists of directing and controlling a group of people under a person to guide them to achieve the collective organizational goal that they are targeting. Managers usually work for the company, unlike leaders who work for the welfare of the employees and for personal satisfaction. Many managers tend to be smart and have the skill to analyze the situation so as to guide the employees towards the company goals. One of the most recognizable traits of a manager is the persistence to stick to a rule or principle, even if it is not agreeable by the employees. They are more work orientated rather than caring about the welfare and emotions of the employees and team members. Managers are more result oriented in nature. There is a slight thin line between a behavior of a manager and a leader. A manager doesn’t care about the growth of his team member, all he is concerned about his growth using their efforts. But a leader tries to encourage his team first, then think about himself later. Therefore, a manager needs to be a person who can manage his work stuff along his team members career growth irrespective of his profit. Most leaders focus to have a large following of people and subordinates who share the same views and opinions as them, while managers are more concentrated on managing the tasks and duties that is handed over by the company. As a matter of fact each and every employee who works under a manager experiences some sort of work tension between his manager and his thinking. There is even a possibility that a manager provided his years of work for the sake of the company growth following the same old process and that is why most of the managers doesn’t believe in changing their work process. Where in which, when it comes to a leader, he tries to create change in his way of work so that it can create some development. The main reason for such a behavior is the fact that a manager prefers to see stability within the team, while leader prefers to see change in the end results. Most leaders focus on changes that are long term and are in favor of the employees and the subordinates while the aims of a manager are short term that are driven by the company rules and guidelines. There is a quite obvious reason for employees not to like their managers as they love their team leaders. A manager tries and transfers his load of work to another employee in his team, but a leader tries to share the load and help all the rest of team members so that they can finish the task together without any issues. Therefore, it is necessary to understand these differences of a leader and a manager to compare their work process better. Leaders lead people due to the passion and excitement that they share for their works. In contrast, managers guide employees and subordinates so as to get money for work. Leaders get personal gains while managers get capital gain. In some workplace, there may be a possibility that a manager can be easy on his team of employees, but it is impossible for him to stay that way because of his selfish motives to fulfill his career growth. Similarly, when it comes to a leader, he always thinks about his team first. A leader presents his team all sorts of appreciation for the work they delivered. Most managers tend to take the credits of the success and achievements while a leader gives and shares the credit of their achievements to the well deserved colleagues. At the same time, a manager is the first one to blame the employees because of mistakes that they make while a leader takes blame for any kind of mistakes and errors that the subordinates do. Therefore, every employee expects his employer or a manager to act as his team leader than a manager. It is very common in every workplace that a superior implies or uses his power to degrade the lower level employees efforts in the office. Especially when it comes to managers, they try to use their power to save themselves first than their team, but in another way a leader stands with his team and try to develop power within them so that they can stand for themselves instead of depending on others for their rights. Many managers see power as a formal authority that gives them right to order and express their needs to the employees in a company or an organization. They are more oriented towards controlling power. This is not true for leaders; they usually see power as a part of their personality rather than a formal obligation. Hence, they try to be as proactive as possible while leading and coaching a team. While working in the office it doesn’t always mean that a manager tries to be mean, among everybody, but the actual truth is that he needs to be mean and critical with his employees so that the employees of the company takes his command very seriously. And that is why most of the managers never discuss new ideas with the employees of the company, but when it comes to a leader, he tries and implement his ideas in the task so that he can make the workplace better. Leaders try to sell their ideas and opinions to the employees while a manager tries to implement the opinions and values of the company directly onto the workers. Most leaders tend to break the organizational rules and pave way for the employees and coworkers while manager strictly follows the rules and regulations of the company so as to provide the supervisors with satisfactory results. When some candidate starts his career for the first time and is excited about working in a company, then that particular person needs to be treated positively. But in most of the cases in the workplace people believe and appreciate results more than one’s efforts towards the task. Therefore, it is necessary for an employer to appreciate his team and employees better so that they can feel motivated towards their job. Many leaders tend to think outside the box and they focus more on the efforts taken for achieving a goal rather than the final result. Managers tend to think more along the lines of the organizational goals and they give more importance to the final result produced rather than efforts put by the subordinates. It is a common approach that each and every employee of the company expects from their higher employees that they should support the young talent than developing their position in the company. It is not necessary that only a person who worked for several years in the same company need to be qualified for all sorts of opportunities in the company. Similarly, a manager needs to support people with talent in similar field of work instead of stealing credit for their work. It should be noted that a leader always have a large number of followers and supporters who support the same kind of vision and opinion as the leader. A manager on the other hand has a large number of employees, workers and subordinates who work under him who may or may not share the opinions as him. There is a possibility that people consider and pin point only negative elements in the work behavior of a manager, but nobody even tries to understand that his critical behavior helps employees push their limits in the field of their work. Many leaders tend to find opportunities to create a statement within the organization for achieving their goals and aspirations while a leader tries to use the given resources so as to avoid any unnecessary conflicts between coworkers and employees so that it will not affect the final result that the company expects from them. Therefore, a leader seeks all sorts of opportunities for his team, but a manager tries to evaluate those opportunities first so that the manager can determine a suitable candidate for the task. A manager needs to act responsibly towards the work that has been assigned to him by his higher authorities. It is necessary that every task performed by the team of employees needs to be evaluated and conducted within its own budget. Where in which a leader empower all the skills and efforts of his team irrespective of the budget extension. Leaders tend to set direction for the workers to achieve the collective goal, while many managers tend to guide the employees by planning a detailed path for the employees to follow so as to provide the results that the company and the supervisors expects from them. Also, leaders tend to transform the working style of the team while managers use the work and performance of the team members as a form of transaction between the company and the working individual. Therefore, it is necessary to handle both budget and the team performance equally in the overall development of the company. Finally, the bottom line is that there are some positive and negative things in a work behavior of the manager and the leader. But the main thing which matters the most when it comes to a difference between leader and manager is that an employee can evaluate the intentions behind the work behavior of a leader and a manager. 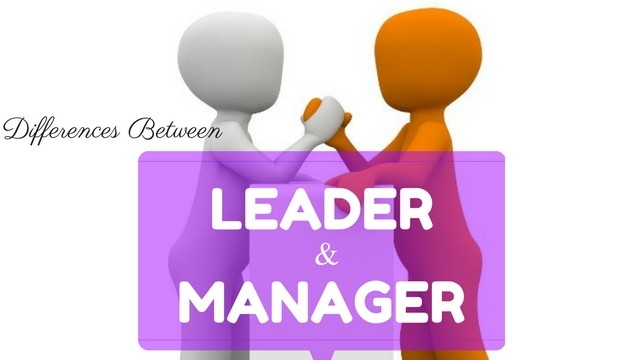 Therefore, if anyone interested in knowing more about the difference between a leader and a manager, then they can read all the above mentioned details about it.